Five men, including two armed with a Taser and a knife, are being hunted by police after an aggravated burglary. Valuables, including a games console and phone, were taken in the raid in Poole at about 19:30 GMT on Saturday. 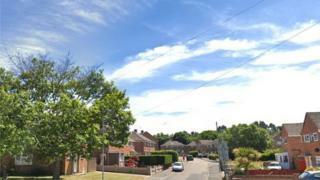 A man in his 20s living in the house in Maryland Road, Hamworthy, suffered cut and grazed hands. Dorset Police said one of the suspects was known to one of the occupants. They are trying to trace a white Ford Transit van seen in the area. Officers said one of the men was described as black, about 6ft 2ins tall, of medium build and wearing black clothing. He was also reported to be carrying a knife. Another suspect was described as white, about 5ft 9ins tall, aged in his mid 30s, with a receding hairline and wearing jeans and a jacket.